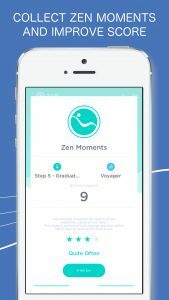 Use the Zen Moments feature to rate your relaxation and contribute to your Aura Score. If you have any pain during your session, keep going to facilitate the energy flow to work on the blockage. If you fall asleep during your relaxation you are probably dealing with a lot of stress or exhaustion. Please note that some beginners may have to practice a while to experience a good relaxation. When genuinely relaxed and expanded you will be fully aware of your surroundings whilst mentally detached and with a deep feeling of joy.